This is part 1 in a series of profiles on live art exhibits as part of the LuminaTO festival. Two of the most prevalent themes of the LuminaTO festival are without a doubt interactivity and collaboration. Coming from a technology background, I always find some of the most compelling innovations in the industry have come from transparent collaborations between groups of people. This is often defined as "open source" development. Be it the completely open contribution-based community behind Wikipedia, the democratically inspired nature of digg, or the more ambitious Open Architecture Network, there never seems to be enough cooks in the kitchen when it comes to forging new ideas. I'm of the opinion that the same holds true for art. Discovering the many layers of complexity that go in to creating a work of art only serves to further enhance its underlying beauty. As it turns out, the opportunity to observe and influence the creation of many works of art is right at our fingertips all through this week. Nowhere is this concept more clearly shown this week than with Carlito Dalceggio's Live Art on the West side of Hotel Le Germain's brick facade on Mercer Street. When I first wrote about Carlito's work back on day one, he'd painted a collection of words that best represented beauty: truth, love, and timeless, among others. Since then, Dalceggio has sewn together a rich tapestry of colours, shapes, and ideas, many inspired by onlookers and through his blog. Watching the art develop either through his online chronicles, or in person, we're treated to a truly unique perspective on how an ambitious undertaking such as this is coming to fruition. Beautiful angelic figures, flowing patterns, and symbols of nature, love and humanity now adorn the top layer of the mural, accented by magnificent blue, orange, pink, and gold metallic brush strokes. Drips of paint stream down the bottom of the painting, showing the labour of the work, and possibly a result of our temperamental weather in the city this week. All of these progressions that we can see throughout the process contribute to the overall beauty of the art. 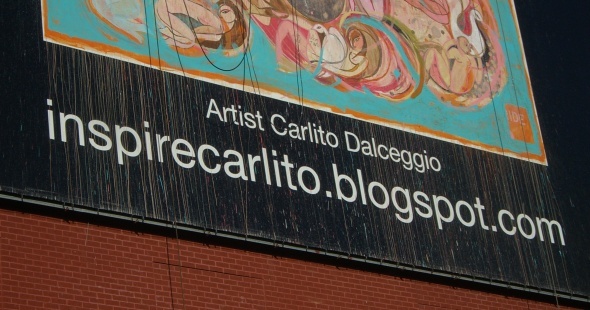 Carlito Dalceggio will continue to paint his live art, "Beauty," every day throughout the weekend from 5pm-12am, wrapping up on Sunday as part of the LuminaTO festival. You can see the mural on the West side of the Hotel Le Germain at 30 Mercer Street. A full-sized version of the mural on day 6 can be found in the blogTO Flickr pool.